Hasbro's GI Joe line continues to be one of the hottest properties in the toy world of today, and their ongoing Modern Era line is flooding awesome product into stores. Much like the 25th Anniversary, though, it's still often pretty hard to find these products, and it is becoming more and more obvious that there will not be enough product to meet demand, so for those who want a full set you either have to resort to eBay scalping, or really walking your daily Target and WalMart beat. This morning I found myself standing with the middle-aged housewives and their small children outside of Target and I watched the sleepy worker open the deadbolt at 8am. Thankfully there were no rabid scalpers with whom I needed to have an embarassing footrace to the rear of the store, but instead had a nice stroll straight to the GI Joe section, and was floored to see that while no other products were stocked new, the wave 5 comic packs were there in abundance! 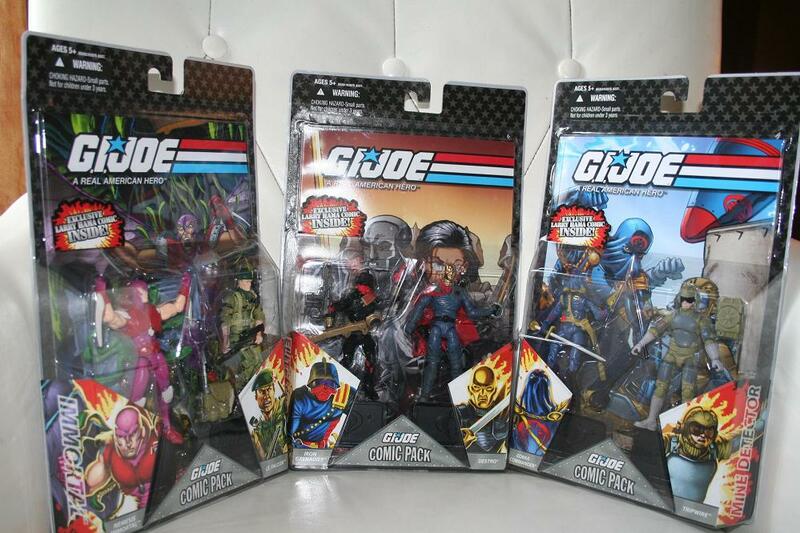 By abundance, I mean there were two each of the three new comic packs but given recent trends that wasn't bad. Collector Tip: There is a variant in this wave to keep an eye out for. Destro is packaged with either a gold or a black head, the black being the more rare of the two. It's already going for a solid premium which will only get worse, so if you are a completist, find it yourself on the pegs before you have to line the pockets of a scalper!